Another cracking episode which helps to further cement Matt Smith's tenure as the Doctor, and brings Amy Pond more into the limelight as a character in her own right. I'm glad that one thing Moffat has retained from previous "New Who", is the practice of tipping the hat to other science fiction creations. Amongst the more obvious nods were a tribute to the garbage compactor/space slug scenes in Star Wars from A New Hope and The Empire Strikes Back, The Hitchhiker's Guide to the Galaxy (Arthur Dent/Amy Pond travelling the universe in nightclothes), and Terry Pratchett's Discworld series (the featured starship is a self contained world travelling on the back of a star whale... in a manner not unlike Pratchett's Great A'Tuin). Amy's first adventure with the Doctor lands her in the far future onboard the Starship UK, a vast vessel that carries all the citizens of Britain onwards towards a new home among the stars (well, apart from Scotland which demanded its own starship... *sigh*). However all is not as it seems. There is a dark secret concerning the ship's existence. The Doctor realises this when noting that a ship the size of Starship UK should have engines so big, that the decks vibrate. He's not alone in this realisation... the mysterious Liz 10, who turns out to be no less than Queen Elizabeth X of Great Britain also has suspicions that something is amiss. In actual fact the dark truth behind Starship UK is available to everyone above voting age, it's just that when they decide to learn the truth... they find the knowledge so disturbing that instead of protesting (or in the case of the Queen, abdicating), they choose to have their memory of being educated, erased. 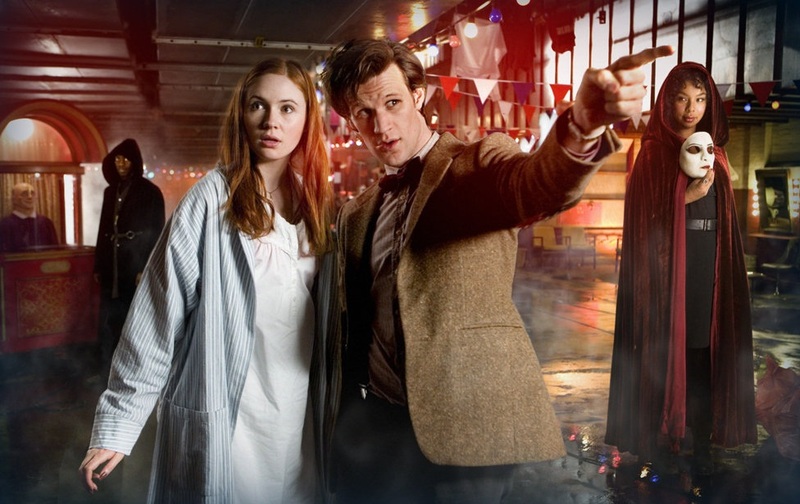 Those few who do protest are cast into a pit of food waste and digested as The Doctor and Amy discover, when after having her memory erased... they decide to investigate the booth again (although as the booth doesn't recognise the Doctor as human he can only trigger the protest/forget mechanism). It is at this point that they realise that far from being in a conventional rubbish dump... they are actually inside the maw of the titular "Beast Below". Ever inventive, The Doctor forms an undignified exit strategy (stimulating the creature to vomit and hence flushing him and Amy out through another orifice). Upon their escape, they are met by Liz 10 and the whole party find themselves taken into custody and escorted to The Tower of London. It's at this point that we as the viewers learn the truth behind Starship UK. It was built upon the back of the last Star Whale which was thought to be drifting aimlessly around the Earth as it entered its last days. The Government of the day captured the beast, built a self contained world on its back and attached pain giving implants that tortured it into being subservient. The Doctor is incensed and angry at humanity for putting him in the position of making a terrible choice of his own. Even Amy doesn't escape his anger because even though she is not involved, she still decided to conveniently lose her knowledge and left herself a message to try and dissuade the Doctor from learning the truth. "Nobody human has anything to say to me today!" Believing that if he frees the star whale the migrating Britons will die and if he doesn't, the beast will continue to suffer in agony; The Doctor reasons that the only choice left open to him, is to overload the pain giving equipment and send the star whale into a persistent vegetative state... where it will continue in slavery but be unable to feel its pain. However as he is about to carry out his plan, Amy has a sudden epiphany. She realises that the star whale is like the Doctor... being the last of its kind, it cannot bear to see the children of another species suffer, and so far from drifting into the vicinity of Earth by chance... had actually chosen to come to offer itself freely. She grabs the Queen's hand and slams it down on the "Abdicate" button. 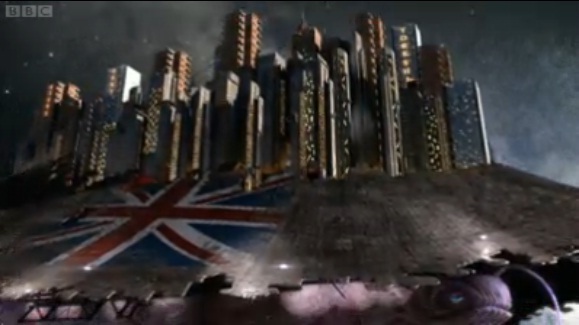 The clamps and implants are retracted from the star whale... but it does not fight free, instead it chooses to continue on its journey as willing saviour of the British people. For me, the two most important themes explored by the episode were responsibility (the importance of the choices we make when we can no longer claim innocence from the truth), and the contrast between fear and love as motivational forces. When I think on the subject of responsibility, it is clear to me that the human race has an amazing knack for going into denial... by either shifting responsibility, or simply finding new and ever more elaborate ways of perfecting the *shrug* gesture. Biblically you can see this trait from the outset... it starts with Adam "What fruit? Oh this fruit? Oh... I didn't know... it's the woman's fault!" and then Eve "Me? Oh I only ate it because I was tricked so even though you told me not to eat it in the first place... it's not my fault". Historically we've been the same ever since. One might argue that the current troubles engulfing the Roman Catholic Church in Ireland, stem from this very same attitude... but although that's a rather extreme example, let's not forget we are all capable in our own way of covering up things we should not have done in the first place.. I guess we find it easier to get on with something if we bury our heads in the sand and hope that it will go away. None of us likes to admit to our own fallibility. I think that's because when we are confronted with our fallibility, we are equally confronted with the truth that we are not safe drivers when it comes to life... and there is a fundamental problem when we put ourselves at the centre of our universe (it's a place we as human individuals are not meant to occupy). It's a favourite passage of mine admittedly, and I'm sure I've quoted it here before... but it seems relevant here. The Government of Starship UK were so governed by fear that it didn't once enter their mind to consider that the star whale had come to Earth to help... they just saw it as something to take advantage of. They substituted their fear of death for a fear of consequence. What would happen if they ever did the right thing by the star whale? It would save itself and destroy them wouldn't it? However... the star whale was not ruled or motivated by fear. The star whale was motivated by love. It came to Earth because it heard the cries of children... and it came to lend whatever help it could to aid them in their plight. It didn't expect to my enslaved and tortured... but do you know what the wonderful thing was? It never stopped loving. Sure, it lashed out at its persecutors... but in the end when they let go of the fear that motivated them... it continued to bear them across the stars. For me, the love of Jesus goes beyond even that. He didn't even lash out at the people who conspired to kill him. His love extended even to those who punished him... "Father forgive them". One of the major difficulties I have with various religious institutions is that they can become so wrapped up in their own fear that they don't give God's love, breathing room. For some it's a fear of looking stupid if asked to step out and do something radical for God - like praying for healing and "what if nothing happens?" For others it's a fear that the mistakes/sins of individuals will reflect badly on the Church as a whole, and so a conspiracy of silence is embraced. For still others there is a fear of losing the traditions and patterns of worship they are most comfortable with, and so a rod of iron and inflexibility is embraced in services. But God is not like us, not in that respect. He is not bound by fear (even though in Jesus he experienced our fears). So what would happen if we took the courage to let go of our fear... and embrace his love? What if we took the courage to stand up and take healing to the people despite our fear? Or if we stood up and said... "PR isn't as important as doing the right thing by God and his people"? Or if we allowed worship to be directed by God instead of our timetable/sense of order? Even in the midst of our fears, God's love is working. Even when things go wrong... especially when they go wrong. We have a greater power, a greater force to cling to in the midst of our fears... God's immeasurable grace and boundless love. And just as the star whale continued to carry the people of Britain to a new home... Jesus Christ will bear us through our journey... both now and into eternity.